I hope I’m not addicted to popcorn! I have been munching more popcorn in these 2 months than I had in the last 5 years!! It all started from the Cornery popcorn that I ate while watching the Lion King musical at the Marina Bay Sands. Check out my yummy account here. I have been comparing the Garrett popcorn and the Cornery popcorn. I concluded that the Cornery butterscotch popcorn is way superior to the Garrett Caramel popcorn. I was at Ion Orchard and I chanced upon the Cornery store. One amazing thing – they have a HUGE number of flavors to pick from! Hmmm… what a difficult decision. All look so yummy. I chose the butterscotch (who ever forgets her first love??) and a cheese one. There! My 2 tubs of Butterscotch and Cheese. I still love the butterscotch one! It still tastes WonderLicious! As for the cheese one, I find that it’s not as “well made” as the butterscotch one. The shape for one… it’s not round… And it is not coated evenly, with only one side having a sparse sprinkle of the cheese. You can see that in my photo. The cheese tasted like the snacks that I used to eat as a child. Compared to the Garrett’s one, the Cornery one tastes like it’s out of a snack bag. The Garrett’s one has a full-bodied cheesy taste. It’s nice and round and coated all over. Verdict : Cheese – Garrett’s has a one up over the Cornery one. hi zhiwei. 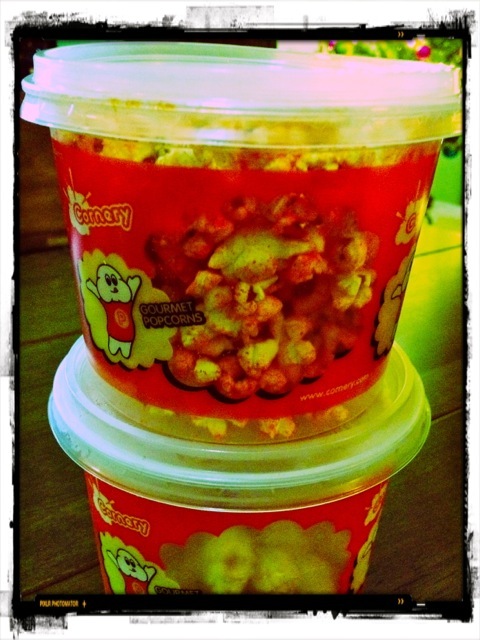 thanks for your lasting “first” love for our butterscotch gourmet popcorns. as for the cheddar cheese popcorns, we use different kernel type, i.e. different genetic makeup of the popcorn plant. this type of kernel produces butterfly-shaped – irregular shape with wings jutting out in all directions – flake when popped. butterfly flakes are more tender and more suited for popcorns flavoured by dusting of seasonings. our cheddar cheese gourmet popcorn is dusted with cheddar cheese seasoning manually; even if our experienced staff is extremely dilligent during the dusting process or we put excessive amount of seasonings, it is still not possible to dust the popcorns very evenly and fully. garrett’s way of flavouring their cheese popcorns is different. they also use the mushroom flakes which are round-shaped. we cannot be sure of their recipe but we reckon it includes cheese flavour in paste form. in terms of the intensity of the cheese flavour, garrett’s up there. our savoury range is designed to be a light snack, tender and not greasy. in addition, our method of flavouring our savoury gourmet popcorns allows us to offer a very wide variety of savoury flavours. garrett’s cheese popcorns have many fans all over the world. for you to compare ours to theirs is already flattering in itself. we like to think that everyone will like at least one flavour at cornery. that is why all customers are pampered with an uninhibited sampling session before they decide the flavour to buy. we feel disappointed if customers walk away without purchasing after they sampled the flavours. fortunately, there are more successes than disappointments. however still, there are rooms for improvement. thank you for your fascinating yet insightful post again! merry christmas! hope to see you again at cornery. Wow! Thanks for sharing the information on the various kinds of kernels and the techniques of flavorings. I’m sure the popcorn-loving readers are intrigued by these fun facts. I will try the other flavors that you have!